We accept that there are going to be changes to the venue but we believe that the plans, as published, seriously threaten the future of cycling at Eastway. However, we believe that there are ways to change the plans, win the bid, and preserve the future of all disciplines of the sport. 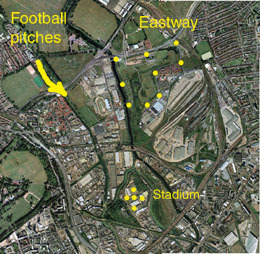 The area marked as buildings on the left is marked as green football pitches on the right, and Eastway, as of now, is green but will be built upon for the Olympics. This conversion of green to brown whilst also converting brown to green is a feature of the plans; specifically, Eastway itself goes from landscaped, mature green to flat green with buildings, and then back to green again. Our suggestions are solutions that seek to minimise such costly transitions and preserve our sport's viability at the venue. At this point it is important to realise there are three scenarios: the Olympic plan, (sketched above), the post-Olympic Legacy plan and the non-Olympic version where London fails to gain the Games. Unfortunately Eastway is lost under all three schemes. Area A (below right) is lost to housing in each plan. This is our greatest fear. Note that this is currently Metropolitan Open Land, supposedly sacrosanct and absolutely vital to the road and off-road disciplines. 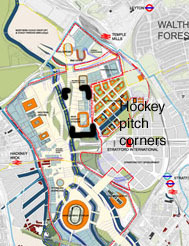 In the Olympic plan temporary hockey facilities (corners marked in black in the leftmost picture) replace the permanent Eastway circuit in areas B and C (below right). The reduced acreage will destroy off-road racing, a side of cycle sport that does not take place anywhere else in the capital. Shorter courses will mean fewer competitors can ride and less interesting courses mean less people will want to race. Races now consistently hit the maximum field size of 200 that our 53 acres can accommodate, proving the popularity of the venue. Reducing the acreage by a third will, on safety grounds, reduce race sizes to financially un-viable extent. 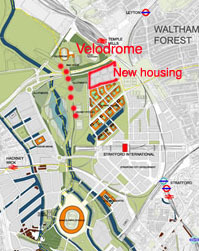 If the clubhouse/changing facilities are demolished and the car parking removed (as would be the case as part of the land lost to housing), and the velodrome not built (as per the non-Olympic plan, see below) there will be nowhere to park, change, shower, take refreshments or spectate from. Opening up the geographical boundaries of the Eastway circuit to create an open park, requiring racers to share use of the land with the general public, will result in a conflict of interest and risk injuries all round as racing cyclists and other park users 'interact'. The plans mistakenly show the area as being public access at present when in fact there are very few public access points with most through-traffic using the cycle path around the north edge. (Eastway is currently bounded by the river Lea on one side and roads on the others, with only one gate for cars and another for pedestrians.) Only the housing area to the South of the circuit has free access, so the circuit is secluded. Almost as serious as these threats of reduced acreage and site access is the loss of the venue during construction. If riders cannot use the venue for six years, as proposed in the building schedules, cycle racing in London would be wrecked. While it may be reasonable to suffer a season's disruption surrounding the Games themselves, the voluntary clubs and event promoters would be seriously damaged and would in some cases cease to function if too large a gap occurs between events. A traffic-free venue such as Eastway is vital for encouraging children into the sport and cycle clubs would go into freefall with a six-year loss of membership, particularly of young members. Add to this the problems of having to rebuild the cycling community and a workable calendar of events from scratch. It would be ironic if cycling were brought to an end in London as a result of, of all things, the Olympic Games. We would also urge that plans to build the velodrome and the BMX track as pre-bid criteria (commencing in 2005) be re-visited. This would not only help to ensure the continuity of cycling provision but also dramatically increase the standard of local riders to be competitive on the Olympic stage in 2012. We cannot guarantee to win more medals, but it will greatly increase our chances. Starting work in 2009 will cost the same and will not increase our chances. For the housing, we suggest that other areas be considered; land that is already brown would seem to be the most logical option. Converting already mature, green land to brown is environmentally and economically unsound and, as we've pointed out, that green land is in constant use. 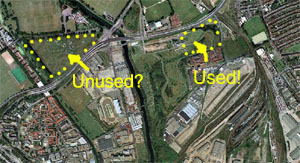 However, if for some reason green land must be used there are other areas nearby which are not currently used by thousands of active sportspeople, as shown in this picture. We suggest that the hockey facilities (stadium and practice pitches) be sited elsewhere. We have spoken to the hockey governing body and they would like their facilities to be "near the Olympic Village" (their words). The options indicated below are both less than one kilometre from it. 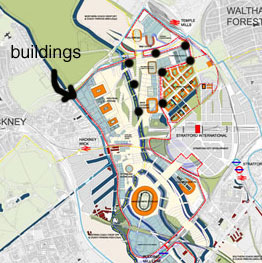 Hackney council is, at the time of writing, constructing two, full-size and two junior soccer pitches within the planned Olympic precinct. They too are less than 1km from the Olympic Village site. This would seem an ideal place for hockey practice grounds: simple to convert and to revert back to soccer use, post-Games. 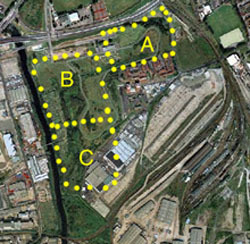 Or, the area of the old Hackney dog track. It is already flat and the plan is to turn it green as part of the Lea Valley reconstruction. Wouldn't this be an ideal place for the hockey stadium? Travel to and from these sites from the village would be easy. There are also proposals in the plans to build tennis training facilities on Metropolitan Open Land. These too could be accommodated on brown land adjacent to Temple Mills and the railway line without inconveniencing the athletes unduly. And there are other benefits to our suggestions notably that a 53-acre piece of green land, restored 30 years ago, is not dug up twice and that this easily secured, secluded and attractive area is available right next to the Olympic village for the athletes to enjoy during the Games. If our suggestions cannot be implemented a whole series of questions arise. 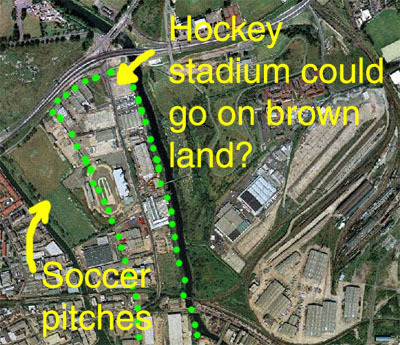 We need extra land to compensate for the MOL taken for houses and hockey; where will it come from? How will the safety of cyclists and other park users be ensured with the new circuit in the central part of a public park? What facilities will be available in the non-Olympic scenario with no velodrome? How will the local cycling community feel about the destruction of a popular local facility? This latter point could lead to dissent and disaffection within the cycling community with respect to the Games generally. This in turn would pose a risk to the bid, since the IOC is sensitive to local opinion. Add to this the fact that cycling is a major sport in countries like France, Spain, Germany and Italy. Overlooking the sport's appeal could be a mistake. Even in the UK cycling is growing rapidly, in terms of both participants and international success. National plans to become the world's top cycling nation by 2012 are achievable. The Games bid is going to be very closely fought, strengthening cycling's position within the overall bid can only help. We think our proposals have found ways to preserve the future of the cycling at the venue and fit with the bid. But the size of the available land for both road and off-road riding (affected most notably by the site of the housing and the placement of the hockey pitches) and the degree of access to the venue by the public will dictate whether cycling can continue at Eastway. If the road circuit is cramped or uninteresting to race on, or if the land available for off-road use is too small, or if it's too dangerous to race because of pedestrian access, then we can see little hope for the sport after the Games have gone. This would miss the opportunity to create, as legacy, a multi-disciplined cycle park that would be the envy of the world. In addition, the conversion of brown land to green at the same time as converting green land to brown, seems to defy both common and economic sense. Housing being built on green land, supposedly with the most-protected status, and currently heavily used, rather than on unused green land or, better still, reclaimed brown land, again, seems questionable. Leaving something alone is clearly much cheaper than building on it; when this is also a better option from the point of view of sports provision, it makes sense to save the money. We make these proposals in a constructive manner and hope that it will be possible to consult fully with the planners and architects to bring about workable solutions. We feel that what is, in essence, a very strong bid, is weakened significantly by its failure to properly understand the current usage of Eastway. We hope that plans drawn up under pressure of time can have the necessary changes made to them just as speedily. We would be happy to be consulted about how to draw these proposals together in a strategically viable plan. We feel that London's bid for the Olympic Games would be much stronger if our proposals are taken on board. Plans that lead to the demise of existing sports facilities are sure to be rejected by the IOC, and rob London of an otherwise excellent chance to host the Games. We have serious reservations about advance plans for the Non-Olympic redevelopment too. Wherever the 2012 Games are held, we hope developers will see the potential benefits for health, sport and leisure that the venue provides. These top-class facilities will then help to train Olympic riders long into the future. We urge the Olympic planners to take note of our suggestions. The Eastway Users Group is comprised of event promoters, managers of cycling facilities, representatives of the committees of British Cycling divisions, riders, parent of riders and officials of several different cycling clubs. The letter and the accompanying Book are written with the full authority of the Eastway Users Group.